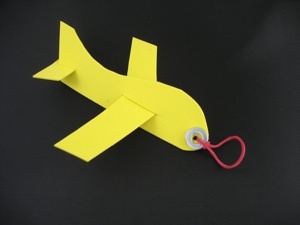 Make an airplane out of styrofoam trays, cardboard, or balsa wood. 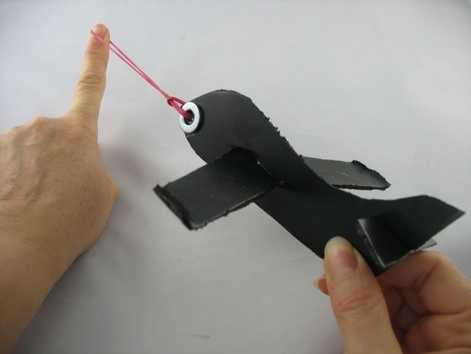 Throw it to make it fly, or use a rubber band to shoot it into the air. It flies especially well with the catapult. 1.Print out the pattern. One pattern is a more realistic plane body, with curves, and another one with straight lines which are much easier to cut out. 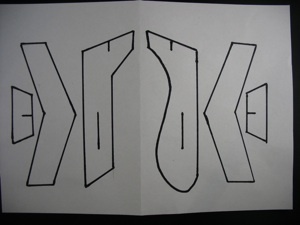 2.Cut the shapes out of styrofoam trays (the kind that vegetables or meat are sold on), cardboard, or balsa wood. Since these materials are easy to break, be sure to have extra on hand incase some of them break while the boys try to make them. 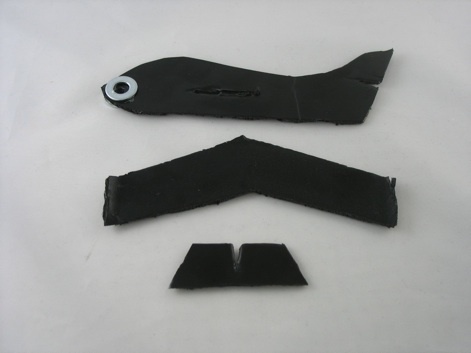 3.Cut slits for the wing and tail rudder where indicated, with a box cutter or sharp knife. 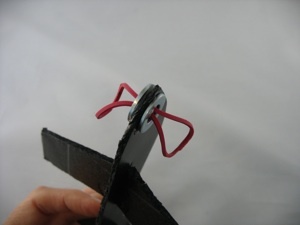 4.Widen the slit by gently pressing one blade of a pair of scissors through the slit (you can skip this step if you are making it out of cardboard or EVA foam.) Be careful not to make the slits too wide or the pieces won’t stay in place. It needs to be a snug fit. 5.Ease the wing piece through the longest hole in the middle of the plane body. Styrofoam and balsa wood are quite brittle, and it is easy to bend it or break it as you make the plane. So it is good to support the plain body on both sides of the slit with your fingers of one hand as you push the wing through from the other side with your other hand. 6.Slide the tail into the slit in the back end of the plane. 8.Poke a hole in the middle of the hole in the washers. 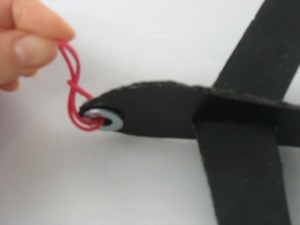 9.Push a rubber band through the hole--use a toothpick or pencil to push it through, if the hole is too small to push it through with your fingers. 10. Push one end of the rubber band through the other end of the rubber band and pull tight. 11. Put the rubber band over the end of one finger. Point your finger up at an angle. Pull the airplane back with the other hand and let go. Watch it fly. 12.Note: for younger boys, cut out all the parts for them since it would be dangerous for them to use a box cutter. 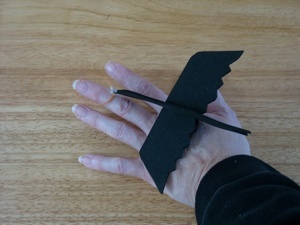 Make a sample plane and test how it flies before teaching boys how to make the planes because variables in the materials can make a huge difference in how it flies. If the plane has trouble flying, try moving the wing or tail pieces to a different angle. If the plane quickly dives nose first, the washers may be too big and heavy. You probably can’t pull the washers off of the plane without destroying it, so make another plane and use smaller washers. If the plane still doesn’t fly well, try trimming the plane in various places. Of course, if you trim one side, it needs to be trimmed in exactly the same place on the opposite side to keep it symmetrical, or it will not fly straight.